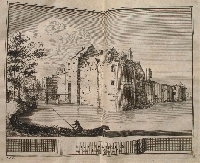 Schatkamer der Nederlandsse Oudheden; of Woordenboek, Behelsende Nederlands Steden en Dorpen, Kasteelen, Sloten en Heeren Huysen, Oude Volkeren, Rievieren, Vermaarde Luyden in Staat en Oorlogh, Oudheden, Gewoontens en Lands wysen. Full contemporary calf, 8vo., pp. 20, 402, 26. 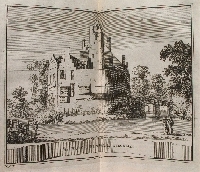 Engraved frontispiece, title-vignette and 60 double-page plates by L. Schynvoet after Roelant Roghman. Spine divided in six compartments by five raised bands, richly gilt, with the titles in gilt on a red morocco label in the second compartment. A clean and nice copy of this book with bright plates. 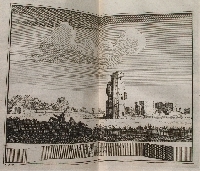 The book was reprinted in 1737 and 1774 with two and three plates extra respectively. Both times the copperplates of this edition were reused.